Expert skiers tip the skis on edge from the feet and ankles - many skiers though have a tendency to stick the hips out, drop them into the turn and help edging the skis that way - this is called hip dumping. It is not a good idea and usually indicates some problems with the setup and stance or too many bad habits++. See Tipping not hipping for details on how equipment affects hip dumping and ideas on addressing it. Sure enough, to have the skis on edge, the COM (i.e. body) must be lower and inside the turn, this concept is referred to as inclination of COM... so, if the hips need to be low and inside the turn anyhow, you may ask well, why does it matter how they get there? It is very important! Performance skiing (as well as good skiing in balance) is driven from the lower body and complemented with the upper body. When you edge or steer the skis from the hips, similar to pivoting by counter-rotation and other upper-body driven forms of skiing, the skier is not in solid balance, not in contact with and in touch with the snow. Note that at the high end of skiing, you will often see what looks like a lower hip at the apex, when the skier is at maximum angles, but that is not hip dumping - far from it. It's not a matter of a static final position, but of how the skier got there! The biomechanics of high performance skiing are addressed in the topics at the black/expert and racing levels. 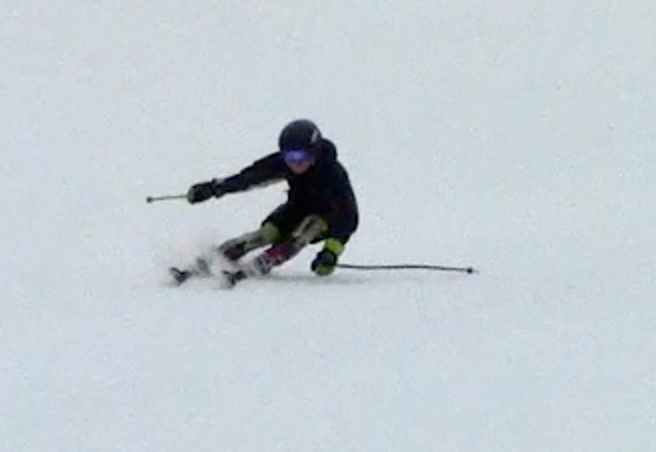 Put another way, hip dumping is when the hip puts the ski on edge rather than foot tipping. When the hip is the first to move into the new turn, dragging the skis on edge as a consequence. When hip dumping, the hips (body/COM) are moving inside the turn too fast and/or too early. 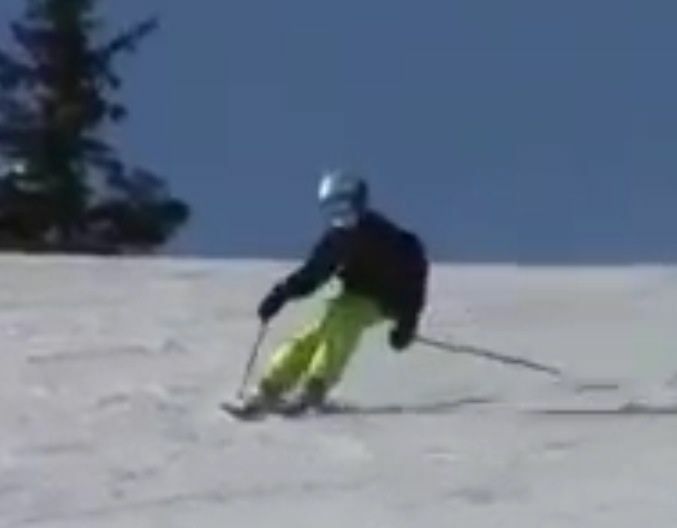 This is generally done with the hips on top of a long outside leg, as the skier's mass basically drops inside the turn. It is ineffective because you're using the upper body to turn the skis rather than the feet and we established that's just not cool and you'll also have problems when the going gets tough like ice, powder etc as you have exhausted the range of motion available for balance. That's hip dumping and is very different from foot tipping. As you can see, hip dumping is also accompanied by Park and ride where the skier builds all angles at the beginning of the turn and just rides the skis statically around the rest of the turn. Also, generally there is an A-frame as the inside ski is ignored and extra counter, to allow the inside hip to move in early. The outside leg also stays long, with no sign of flexing. 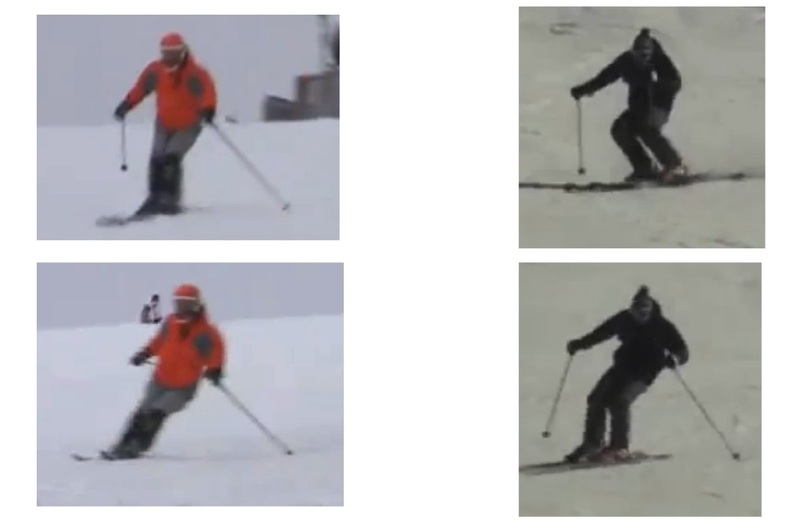 Another sign of hip dumping is shuffling the inside ski forward and exaggerated counter-rotation of the upper body, which allows the skier to both lower the hips into the turn and retain some lateral balance while doing so. Member-only content avilable (273 words). Member-only content avilable (136 words). See Tipping not hipping for ideas to addressing these issues. Viewed 4879 times ( | Print ) this page. I'd like to see your drawing of the physics of this. Two points about hip steering: 1 It's the same as the static position when facing down a hill on a steep slope 2 If a skier doesn't move their hips to the inside of the turn then they are going to be banking their upper body, depending on speed and tightness of the turn, preventing separation of upper and lower body and inhibiting quick turns. Hi John - thank you for the opportunity to update and complete this topic. I added a couple of videos and a biomechanics section instead of a drawing, because this is a dynamic concept, not captured well in a static diagram. Hip dumping is not hip steering, but they are related, as they're both forms of upper-body skiing and we do not recommend that, as they impair balance. Skiers are well served by avoiding upper-body driven skiing like pivoting, counterrotation and instead focusing on controlling the skis with the lower body, i.e. foot tipping etc - that creates separation and good balance. Basically, hip dumping and hip steering are the opposite of separation.